To become more agile, companies are re-evaluating their workforce strategies. Although strategists often talk about “total workforce management,” what their companies need most is something much simpler: total workforce optimisation. For most businesses, human capital is both the organisation’s most important asset and its largest single operating expense. It is also a constant concern for executives who fear they don’t have, and can’t acquire, the right mix of top-tier talent to compete and succeed. Total Workforce Optimisation is the process of determining the right mix of employee and non-employee talent to meet operational requirements. It ensures that the organisation has the skills it needs as well as the flexibility to anticipate and respond to market changes. Total Workforce Optimisation is sometimes confused with Total Workforce Management (TWM), also called Total Talent Management (TTM), which is a much larger and more comprehensive process. TWM/TTM not only incorporates the engagement and management of employee and non-employee labor, but also issues such as training and succession planning, which are outside the scope of Total Workforce Optimisation. Total Workforce Optimisation is also different from Total Talent Acquisition (TTA), which is a subset of TWM/TTM. However, Total Talent Acquisition is compatible with, and can be incorporated into a Total Workforce Optimisation program. Total Workforce Optimisation is actually very simple. It is nothing more than looking at your organisation’s entire employee base and your non-employee base, putting them together, and determining the right mix to achieve your desired business outcome. The focus on business outcomes is one reason Total Workforce Optimisation is more specific and easier to achieve than Total Talent Management. While Total Talent Management has the potential to offer great long-term benefits, which are often somewhat abstract, Total Workforce Optimisation is concerned with finding the most cost-effective, highest-quality way to accomplish specific tasks and achieve specific outcomes. Total Workforce Optimisation is the process of modeling and sourcing the right mix of employees, contractors, freelancers, and consultants—all viable labor options—to achieve the outcomes that are important to your business. To get there, there are six key steps you need to take. To implement Total Workforce Optimisation successfully, you must start by getting all of your workforce data in one place. It is all about visibility. Most organisations are already doing a great job in terms of employee visibility. You probably have human resource platforms containing all relevant employee data. So, the missing link tends to be non-employee data. With the advent of vendor management systems (VMS) about 15 years ago, we started collecting data addressing the contractor population. And, about 7 years ago, organisations started managing statement of work (SOW) based activity and putting that data into their systems as well. With the advent of the gig economy, freelancers represent another large labor pool whose data must be gathered and put in one place where it can provide visibility. This can be accomplished using your VMS or possibly another system, but the important thing is to gather this non-employee data and make it visible. The second step is to risk-proof this workforce, both employees and non-employees. This means ensuring proper classification of every individual worker. Every organisation has a governance model in place to protect against co-employment and statutory compliance risks. To risk-proof your workforce, you must ensure that every worker is in the proper employment bucket. You start by putting them in the right classification bucket and then ensure that they’re in the right sub-buckets—temporary staff or contractors, W-2 or 1099, outsourced labor, freelancers, interns, or retirees. Then you can confidently put them to work and not worry about what the legal, compliance, or security consequences are going to be. The third step is very important, and for some reason, it appears to be very elusive for many companies. It is simply the process of ascribing quality to all workers and all work efforts. Organisations do that already when it comes to full-time employees. Virtually all organizations require periodic performance appraisals, as well as quarterly KPIs or similar processes. So, the concept isn’t foreign, and implementing it is not a challenge. The challenge is to extend this process to contractors, to consultants, and even to freelancers. Sometimes clients tell us that they’re afraid measuring non-employee quality due to co-employment risks. We believe that is only an excuse because there are ways we can assign quality measurements to the work effort and even to individuals without getting into co-employment trouble. So, organisations must correct this misconception internally. 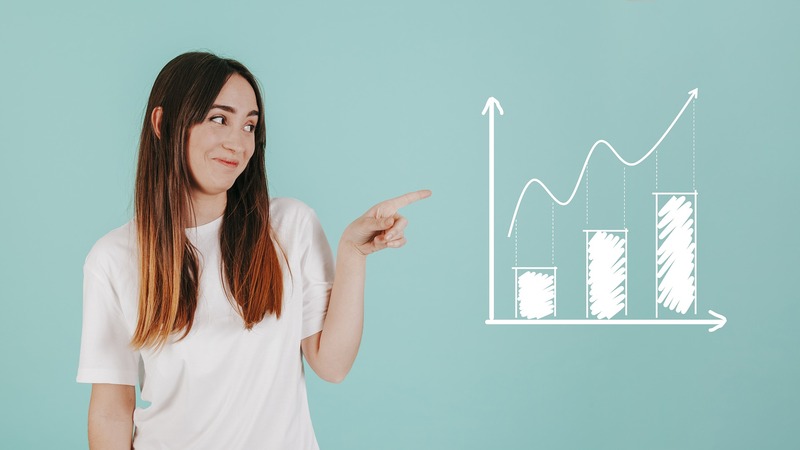 Once you become comfortable with ascribing quality to all workers and all work assignments, you can rate the work and tie the cost equation to the quality equation. For years, organisations have been so focused on costs and the lowest bill rate. While this is valuable, it is also short-sighted. To optimize the workforce, it is absolutely essential to factor quality into the mix. If your organisation has good employee data, and make a serious effort to bolster your non-employee data, what is next? The next step is to merge those two together. It does not necessarily have to be one database. Organizations have separate Applicant Tracking Systems and Vendor Management Systems. Analytics programs available today can consume data from both sides with ease. By analyzing and comparing this data, organizations can get to what is really interesting and fun, which is the modeling. Modeling leads to predictions, forecasting, and what-if scenarios. That is the next step. Once the employee and non-employee data is merged, the next step is to analyze and apply the data. Artificial intelligence and the spectrum of the analytics available today allow organizations to use visualisations to discern where changes in the workforce mix will produce the most benefit. For example, you may traditionally be working with 80 percent employees and 20 per cent contractors. On a specific task that will deliver a specific outcome, what would happen if you changed the mix to 50 per cent full-time staff and 30 per cent consultants, 10 per cent freelancers, and 10 per cent contractors, based on skills? How would that compare to other possible blends of resources. Modeling also allows you to factor in scarcity of talent, core and non-core positions, and other considerations. Once you start to bring these factors into play, you can engage in a variety of what-if scenarios to determine what would best fit your business strategy. Of course, the last step is to do it—simply execute a workforce optimisation program. Create a model and try it. You are probably closer to Total Workforce Optimisation than you imagined. You already have a tremendous amount of data. What you lack—probably the performance quality data from certain elements of your extended workforce—can be obtained with a little effort and the right technology. Of course, implementing Total Workforce Optimisation cannot be accomplished by snapping your fingers. It will take resources and commitment. But your workforce mix is critical to your organisation’s agility and competitiveness. So, now is the time to begin to make progress toward the goal. And, frankly, the technology is there to enable you to reach it. To find out more, click here. Doug Leeby will be speaking at Big Ideas Chicago on 27th September. For more information and to request an invitation to this leading CPO event, click here. 92 per cent of respondents believe that by 2030, procurement will look very different to today’s profession. But what exactly will this evolution look like, and how do we get there? 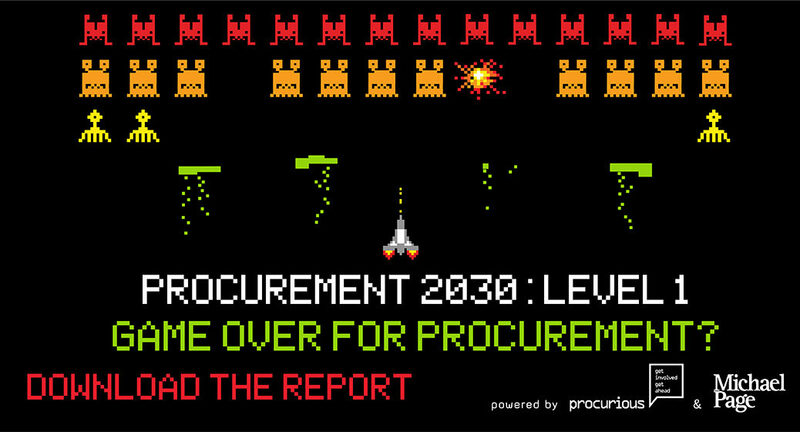 Download the Procurement 2030 Report! 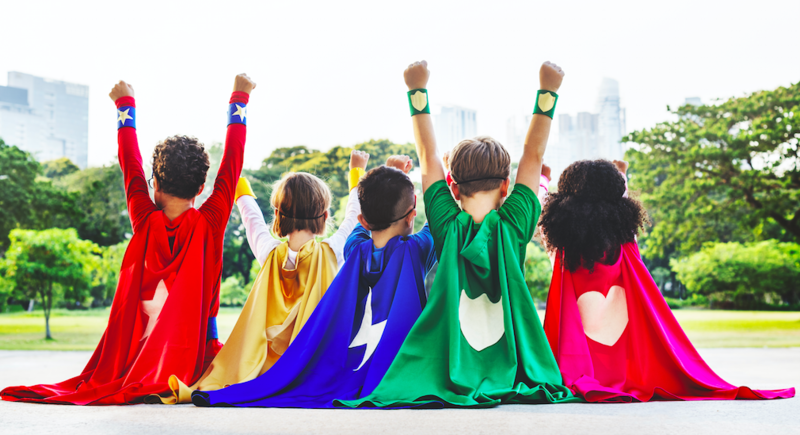 Procurious and Michael Page UK recently surveyed 590 procurement and supply management professionals from around the globe to uncover the facts about the outlook for the profession, the threats and opportunities facing procurement, and perceptions of procurement. Here’s what we uncovered in our new report, now available for download. All but 8 per cent of survey-takers roundly rejected the suggestion that procurement in 2030 would be similar to today. This stands to reason, given the transformation the profession has undergone in the past 10 to 15 years from back-office function to an influential and highly-visible part of the business that’s increasingly focused on driving innovation and generating value. Just over half of our respondents believe procurement will evolve into “an agile group of strategic advisors”. But what does this actually mean? It could refer to Agile (with a capital A) work practices that are sweeping through many of the world’s top organisations, or perhaps it means that procurement will evolve into a high-value team of experts who will move around the business to give advice at the highest levels and solve specific challenges. To use an analogy from the gaming world, this evolution is a bit like moving from a Space Invaders-style “mission-control” approach where you are dealing with a never-ending stream of issues from the bottom-up, to the approach taken in 21st-century games such as Fortnite or Call of Duty, where a highly cooperative group of professionals with different areas of expertise parachutes into a certain area to solve a problem before moving on to the next mission. Survey-takers with “junior” roles identified 59 per cent of their workload as tactical in nature. Analytics professionals have the most tactical tasks (57 per cent), followed by supply chain professionals (56 per cent). The tactical workload of category managers sits at 46 per cent. Concerningly, 57 respondents who identified as Chief Procurement Officers indicated that 40 per cent of their workload is tactical on average, despite having what is regarded as a highly strategic role. It’s also worth noting that two persistent concerns about the future of procurement have also been dismissed by survey-takers. 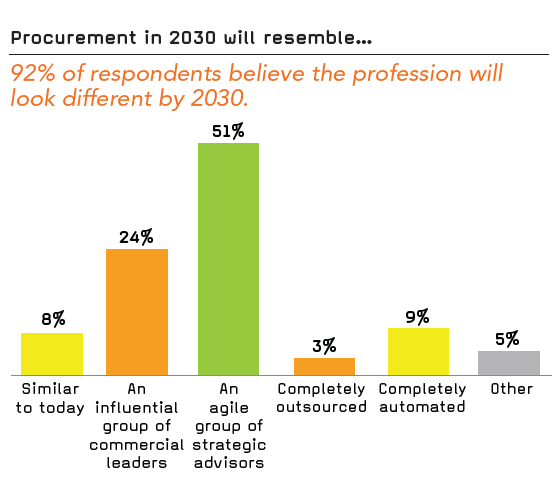 Only 3 per cent believe the profession will be completely outsourced, while 9 per cent believe procurement will be completely automated by 2030. 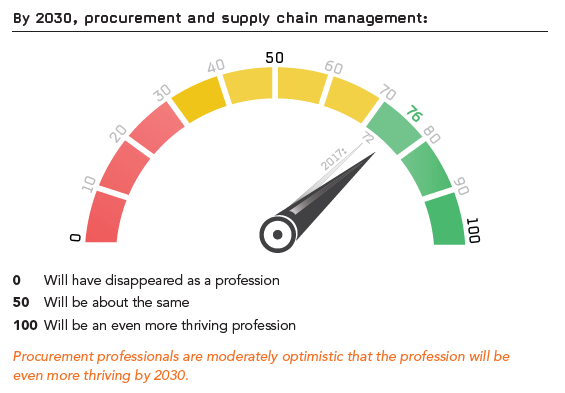 Procurement professionals remain optimistic about the profession, despite the rapid development of ever-smarter AI and media coverage of white-collar job losses to automation. In fact, optimism about the future has climbed by four points since this question was first asked in 2017. Similarly, job security is relatively high. Only 9 per cent of respondents report a lack of confidence that they’ll be able to keep their role of the next 24 months. educate others on the full value-offering of the profession. 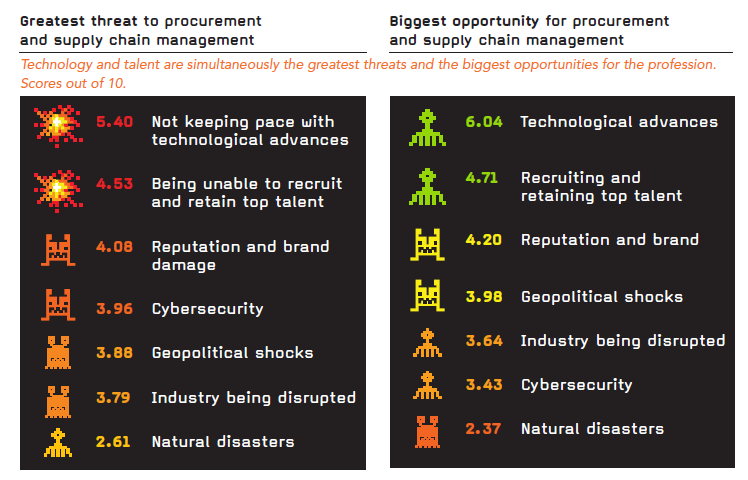 When we asked survey-takers to nominate the greatest threats and opportunities for procurement and supply chain management, we were surprised to discover that the top two threats are also seen as the top two opportunities. “Not keeping up with technological advances” is seen as the biggest threat, while technological advances are also seen as the number one opportunity. Being unable to recruit and retain top talent is seen as the 2nd-biggest threat, while recruiting and retaining top talent is also seen as the 2nd-biggest source of competitive advantage. Organisations must therefore retain their focus on investing in top talent, even while they are investing heavily in technology. It also follows that procurement functions with leading-edge technologies will be more attractive to top-tier candidates. Prisoners of our own perceptions? 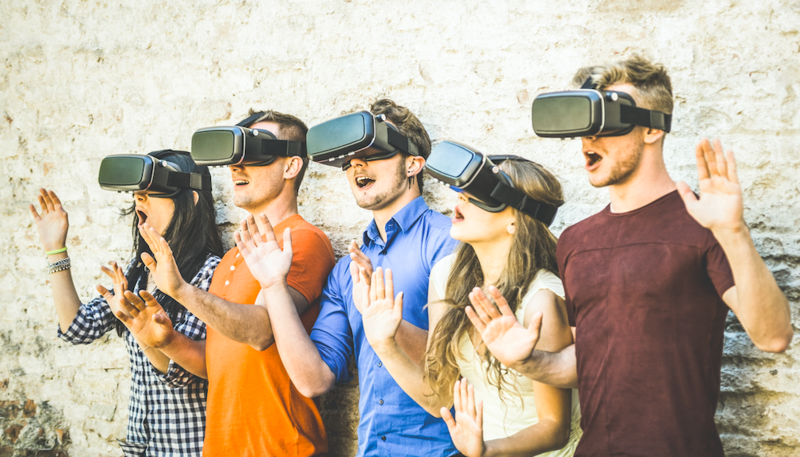 We know that the profession wants to evolve into an agile group of strategic advisors by 2030, but what’s holding us back? In one word: perception. Less than a quarter of respondents say their organisations have a strong understanding of procurement’s value, while 21 per cent have “little understanding” of procurement’s value-offering. 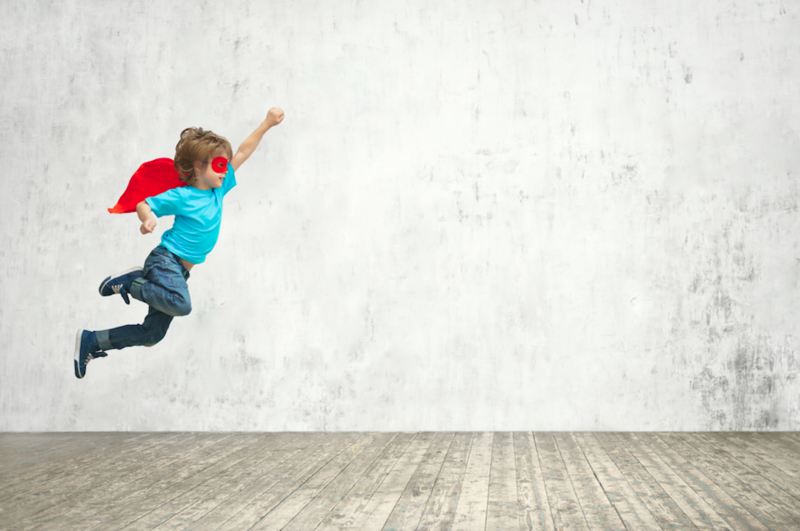 Procurement’s own perception of its purpose needs to change if it is to expand its value offering and transform into strategic advisors and commercial leaders. At present, 38 per cent believe cost reduction is procurement’s main purpose, followed by risk management. The good news is that by 2030, the main purpose is expected to shift to two high-value tasks: “driving supplier innovation (29 per cent), followed by “driving sustainability” (25 per cent). Both of these revised areas of focus will also support procurement’s core capability of cost reduction. 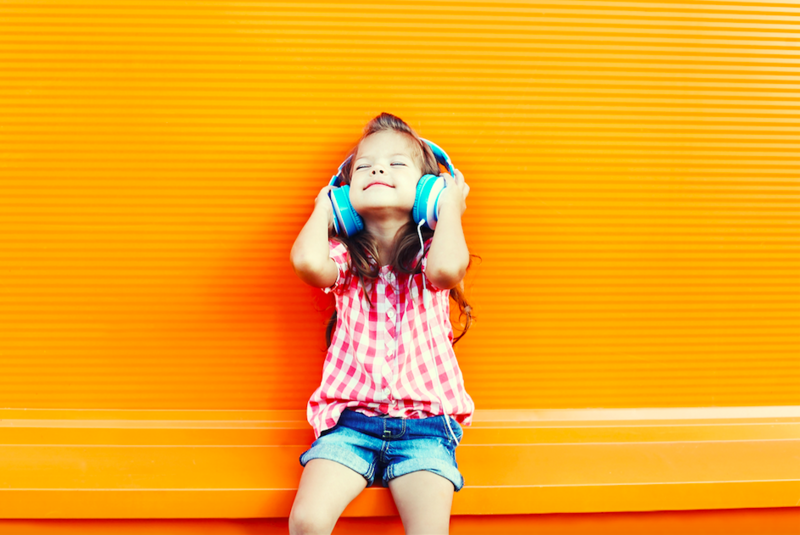 This content-packed report also contains links to heaps of relevant thought-leadership from Procurious and Michael Page UK, including videos, blog articles, podcasts and webinars. 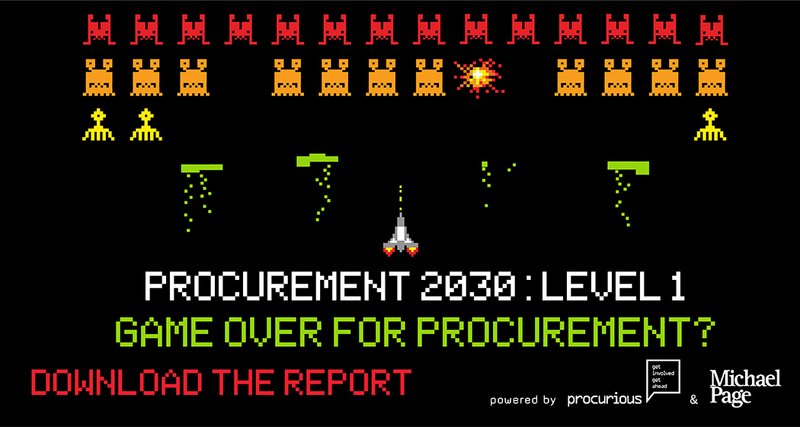 And don’t forget … parts 2 to 4 of the Procurement 2030 report will be released in the coming months! Manufacturing and procurement technology has moved so fast in recent years that it’s entirely possible the trusty maturity assessment you’ve always used is now hopelessly out of date. The other day, someone showed me a quiz from a 1960s Cosmopolitan with a title along the lines of How Good a Housewife Are You? The subject-matter, of course, had not aged well. The reader had to answer questions about what they did when their husband comes home from work – do they put dinner on the table straight away, or fetch his pipe and slippers first? For the 21-century reader, every question in the quiz came across as outdated, and you’d never dream of using it for its intended purpose (unless it was for a laugh). 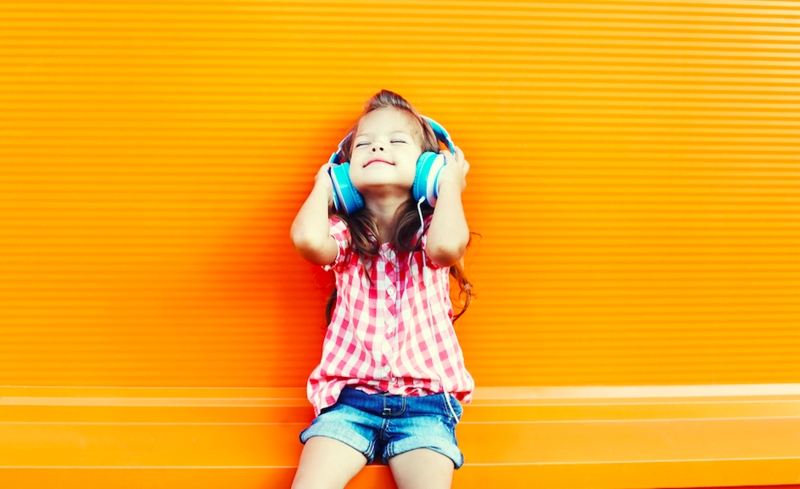 Things change – whether it’s women’s equality, social mores, or technology. The point of the story above is that the way we measure performance must keep pace. In the procurement world, maturity models are one such tool that can become obsolete. Conventional maturity models for direct materials sourcing usually evaluate procurement in terms of outdated capabilities and enabling systems. You know the ones – they focus on concepts such as “upstream versus downstream” and rely on traditional metrics like spend under management. What they don’t do, however, is address the tremendous advances in technology that have transformed the manufacturing world in the last ten years. Nor do they address impaired agility and opportunity risks hidden by siloed data, fragmented ERP systems, and different product management systems. Only 13 percent of companies continuously engage their suppliers; the average organization engages with only 52 percent of their suppliers once a year. Outmoded enterprise analytics and sourcing tools lead to reactive, inward-looking decisions, rather than proactive insights that identify market risks and opportunities before they become a problem. Compared to an average organisation, the most advanced procurement teams use technology to speed up their prep and negotiation time by a factor of ten. Only 5 percent of organizations utilize a purpose-built platform for direct materials sourcing operations. Proof of LevaData’s Maturity Model’s currency is the fact that it takes into account so many of the aspects of Industry 4.0. Founder and CEO Rajesh Kalidindi said the Model is “unique because it captures the impact of contextual market intelligence on sourcing professionals’ decision-making and their ability to leverage open-source analytics, machine learning, and AI-enabled insights with cross-functional teams”. Click here to take LevaData’s Cognitive Sourcing Maturity Assessment. LevaData will host the 2018 Cognitive Sourcing Summit in Santa Clara, CA, on September 13, 2018. The event is expected to attract 150 attendees, with speakers and panels exploring how to accelerate the journey towards cognitive sourcing, with a focus on the latest trends in digital transformation and the adoption of AI among procurement teams. Participants will also hear from Fitbit’s Kevin Purser and others regarding their successful digital procurement journeys and recommended best practices. How to formulate an action plan for when delegates return to the office. The attributes needed to successfully orchestrate, collaborate and negotiate within a complex, technology-enabled global supply network. The uniquely human skills we’ll need to untangle the gridlock of competing interest and find a resolution to the supply challenge in an AI-boosted environment. Interested in learning more? Visit www.levadata.com. Register now for the 2018 Cognitive Sourcing Summit. Do you want to leverage big data in procurement but are unsure how to article the benefits? Here are four ways data analytics is changing the procurement profession. Data analytics will make it possible to have visibility of more factors than humans could ever analyse on their own. With customers demanding the country of origin and the practices surrounding the acquisition of everything in the products they buy, data can help track products through the supply chain. Additionally, procurement professionals can find ideal suppliers with predictive data. Doing so will make it easier for products to adhere to a specific code of ethics throughout the supply chain. As more information trickles through the supply chain, the timeline of risk will shrink. With more visibility, you’ll be able to concentrate on immediate disruptions in the supply chain and respond to those. Tracking weather, traffic conditions and other disruptions that could affect your supply chain will allows for more rapid adjustments, which will in turn lead to fewer disruptions in the supply chain and of the business. Planning for these factors becomes easier with data analytics that can juggle far more pieces of information than humans can. The information procurement professionals will use will make them knowledge leaders for the entire company. For cost savings, the data used in procurement will be invaluable. To take one example, a commercially sold multivariable freight optimisation program saved one industrial company 25 per cent on its air freight costs. The marketing department may consult with the information procurement professionals gather from social media to determine demand. The Internet of Things (IoT), which combines sensors and data analytics, will ramp up automation in the supply chain. Automation will ease the supply management professional’s job, as much of the ordering becomes part of the system. Sensors on store shelves can measure how fast a product is selling, then alert the manufacturer to adjust the amount to deliver to individual stores — or even the total number of products to produce. The head of JDA Labs, an operations planning software company, describes big data and sensors as answering manufacturers’ demands for product placement information. The sensors show where stores place products on their shelves, and informing manufacturers of their product placement is the first step toward automation of meeting consumer demands. Walter Charles, CPO of Biogen, advises companies to include data analytics in their processes and claims businesses do not need a large team of scientists. All they need are a category manager and a group of six to 10 people who know how to use the software to examine bids. Charles used such a team to work with $12 billion when he was at Kraft Foods and had a similar group for $10 billion in work at Kellogg’s. Ernst & Young, EY, suggests the team members know how to work with quantitative data since quantitative risk management will become a critical part of procurement. With the right people and software, you can make data analytics a reality for your business. Analytics will make use of unexpected data. Ernst & Young predicts that by 2025 social media, mobile technology, big data and the cloud will be the primary sources for data analytics in procurement. Analysing this information will be necessary with the right software and people to unpack it. Part of using shared information in the cloud and big data will be keeping the information and your company secure. You cannot ignore the problem, so make sure you always have updated virus screening software. Additionally, keep a firewall for your business. When in doubt, hire a trusted IT security professional to keep your information secure. Is Data Analytics the Future of Procurement? Data analytics will become an integral part of the future of procurement and the supply chain. If you don’t start the process of implementing it in your operations today, you could be behind tomorrow. The information from this process will save you money and make your business more efficient. Data analytics is one investment where the ROI will continue to benefit your business for years. “Don’t Believe the Hype” is a song by Public Enemy that dates back to 1988 and (if loosely interpreted) carries an important message that can be applied to blockchain technology. Blockchain is almost everywhere, and—let’s face it—it’s getting a lot of hype. It is very surprising that such a new and relatively obscure technology like blockchain has received so much exposure so fast, even in mainstream media. Blockchain hype has spread like wildfire, and this is largely because blockchain is the underlying technology behind Bitcoin, a digital currency (a.k.a. as cryptocurrency) that received a lot of coverage in the media. In the wake of the cryptocurrency craze, blockchain has continued to attract more and more attention. The response to blockchain exemplifies many of the issues that are commonly associated with introducing new technologies. Firstly, the market’s inflated expectations do not match the reality of blockchain’s current applications and actual capabilities (see for example: “187 Things the Blockchain Is Supposed to Fix”). Secondly, many consider blockchain as an end in itself when it is actually just a tool that serves an objective or purpose. These are probably the two factors that are doing the most damage to the credibility and future of this technology, despite the very promising applications of blockchain. At its core, blockchain is a form of digital trust, which has a number of potential uses and applications in business because trust is one key component in such a context. However, some of the characteristics of this technology that make it so valuable are also limiting the scope and possibilities of blockchain’s real-world applications beyond trials and prototypes. As with many other things, it is a matter of trade-offs. There is not a single, universal, and magical solution to every problem. So, before blindly jumping on the blockchain bandwagon, it is crucial for Procurement and Supply Chain professionals to know what blockchain is, understand its value proposition, and to be aware of what challenges and issues may be associated with using it. You can trust data contained in a blockchain because of the way records (blocks) are added and managed. Unlike other methods of data management, blockchain is a decentralized (peer-to-peer) network composed of nodes. There isn’t a single “party” managing and owning the data, but rather a network of independent nodes that operate the network. This removes the risk and temptation of manipulating data. Even if someone was tempted to tamper with the data , they would need to find a way to change it at all “n” nodes of the network simultaneously, which is more or less impossible, or, at the very least, extremely difficult. A second aspect of blockchain that makes it such a secure data management option is its unique form of record keeping. “Miners” verify every new record and they must reach a consensus to allow a new record to be added to the chain. On top of this, each new record (“block”) contains a link to the previous block, meaning that it is impossible to change or remove a record without editing the entire chain. This is why data in the blockchain is immutable, which is one of the key value proposition of blockchain (although immutability and the new GDPR do not really work well together…). Looking at the process above, it is easy to imagine that adding a new record in a system like blockchain takes more time than it would in centralized databases. This is because many actors (nodes) are involved and they have to perform tasks (mining) to verify the transactions (and that also serve as prevention against hacking and attacks). So, in its current form, blockchain is a somewhat slow technology when compared to what already exists. For example, Visa processes and verifies transactions more than 7,000 times faster than what happens on the bitcoin network. Another issue is that, all the nodes of the network store all the data contained in the blockchain. This drastically increases the size of the blockchain, making it slower as it grows and more and more difficult to manage. In short, a blockchain network would explode and become unmanageable very quickly in a number of real-life scenarios, such as, for example, if blockchain was used to track the origin of materials and parts across all tiers in a company’s supply chain. There are also other potential threats related to security. Blockchain technology relies heavily on cryptography and peer-to-peer networks that make it very robust and resilient. However, history has shown that almost nothing is unhackable. The blockchain may be incredibly difficult to hack but someone with the right motivation, tools, and probably a lot of time could, one day, hack it. And, as the blockchain’s popularity grows, so does the potential pay-off for successful hackers! Also, even if we were to assume that the blockchain is totally unhackable, the systems around it are not. Systems and programs connected to the blockchain may be vulnerable to attacks and/or to bugs. All in all, the blockchain technology is not a magic solution for every problem. Like any other technology, some trade-offs make it a more or less viable solution. For the blockchain, the trade-off is between three properties: scalability, decentralisation, and security. Today, you cannot get all three! A lack of scalability is probably the most serious limitation of blockchain, and it will probably determine the life or death of the technology. The first generations of the blockchain network, like Bitcoin, do not scale at all and are even incredibly dangerous if you look at sustainability issues and energy consumption. Newer generations are addressing this issue by introducing new designs and concepts. For example, they are moving away from the consensus/mining mechanism that older generations use, which is based on the “Proof of work” concept (miners must perform more and more complex calculations and need more and more computing power and energy to complete them). “Proof of Stake” (PoS) is a newer and much more energy conscious algorithm that will address the “cost” of blockchain and make it a viable option. Another example of how blockchain technology is being updated can be seen in the radical changes being made to the blockchain’s design. In new conceptualizations of blockchain, the design is moving away from linear models, where one block is only linked to the block before and after it (like links in a chain), and are instead moving towards networks of blocks, where one block is connected to n other blocks. The benefit of this model is that operations on records can occur simultaneously on several branches of the network. Another way to look at the trade-offs/dilemma is to consider what can be achieved with blockchain that was previously impossible. An interesting example in the Procurement / Supply Chain sphere is Productivist a service provider that wants to address the “manufacturing surplus” by connecting, , manufacturing companies and their customers via the blockchain. Instead, proceed cautiously and be aware of what blockchain can and can’t do. Blockchain is undoubtedly a powerful and exciting technology, but it is not yet fully mature and has several limitations, which explains why it still is far from being widely adopted, despite all the hype surrounding it. However, the newest (and future) generations of blockchain (that will probably part ways with “blocks” and “chains”) will make blockchain a more viable application than what is readily available now. These new generations, just like the older ones, will not save the world, but they represent a real and unique opportunity to create a platform/protocol which (new) businesses can build on, and which can help them grow. How are digital networks providing greater visibility and helping to achieve savings by making risk more manageable? On route to a recent conference on how procurement networks are reshaping the aviation industry, I realised how amazing it was to be arriving in the historic city of Athens, the cradle of Western civilisation. My enthusiasm owes not only to the city’s timeless beauty, though that’s reason enough to visit. Athens, it turns out, is ideally suited for such a gathering because it holds a unique place in the imagination for all of us who’ve ever wanted to fly. When you’re fortunate enough to have as many Greek family members as I do, you learn about the ancient legends. So the fable of Icarus is well known to me. 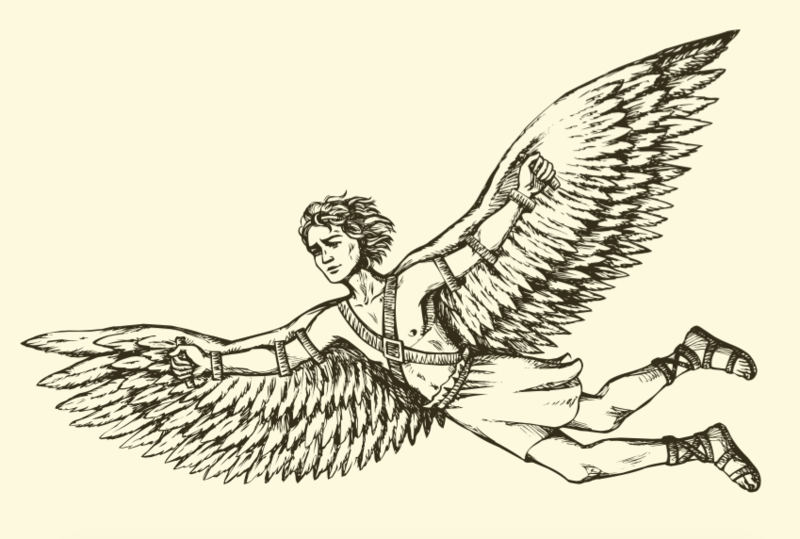 Icarus, of course, was an early aviator. He looked to the birds and thought, “Why not me?” So he constructed a set of wings using wax and feathers. But his father warned him not to fly too close to the sun as the wax would not tolerate the heat. As we all know, Icarus declined to follow his dad’s advice — and, as he soared skyward, his wings began to melt. Icarus crashed back down to Earth. What’s the moral of the story? Some people say Icarus was too ambitious, too proud, too single-minded. They say he flew too high. But I believe Icarus had a different problem. Now, I may not be an expert on classical antiquity. Yet I believe Icarus could have been much more successful — he could have built much stronger, sturdier wings — if he’d only had a better supply chain! In all seriousness, when it comes to aviation in our own time, there’s no mythology about it: The industry faces immense opportunities but also enduring challenges. High demand and low interest rates have fueled significant growth in recent years. Air transport has doubled in volume every fifteen years, with no end in sight. Aircraft keeps getting more reliable, more efficient, more technologically advanced. But high fixed costs and fierce competition are facts of life for airlines. That’s why controlling costs spells the difference between success and failure, in every economic climate. To control costs, airlines are turning to technology to improve operations and the customer experience in four main ways: increasing real-time visibility and control, optimising efficiencies across business functions, enhancing service offerings, and deepening customer loyalty through personalisation and rewards programs. Revenue per passenger kilometer flown. How do airlines engage with customers to generate revenue premiums? Data, of course, plays a key role. What do they know about the passenger in seat 11C? Load factor. How do airlines optimise their routes, aircraft and services to ensure maximum lift per weight? Here again, data proves essential. Unit cost per available seat kilometer. How do airlines maximize efficiency and minimise costs? As with the other factors, the right data leads to the right outcome — for passengers, shareholders, and the environment. Meanwhile, as airlines seek to optimise value, safety and support while improving the passenger experience, they need to be able to track and manage every part and every piece of equipment. Naturally, it helps to do so when airlines can also track and manage the suppliers of those parts and equipment. In an industry like aviation, where risk management is so crucial — risks ranging from weather to regulation to commodity prices to exchange rates — savings become essential. Digital networks achieve savings by making risk more manageable. By providing visibility into the interconnected operations of airlines and their suppliers, cloud-based procurement platforms help to identify and resolve issues before they arise, aided by machine learning and artificial intelligence applications. In addition, digital networks enable trading partners to collaborate on product design and service delivery, thus creating mutual value, extending competitive advantage for their organisations, and empowering them to reimagine not only the airline industry’s future but procurement’s role in shaping it. In the aviation business, real-time collaboration with one’s suppliers unleashes innovation and spurs growth. More often than not, success arises through partnership. Seldom do we succeed when flying solo. Toxic People exist in almost every workplace. You are much more likely to encounter one than not and the further you progress towards the top of your organisation, the more likely it is that you will be working alongside, or for, one. 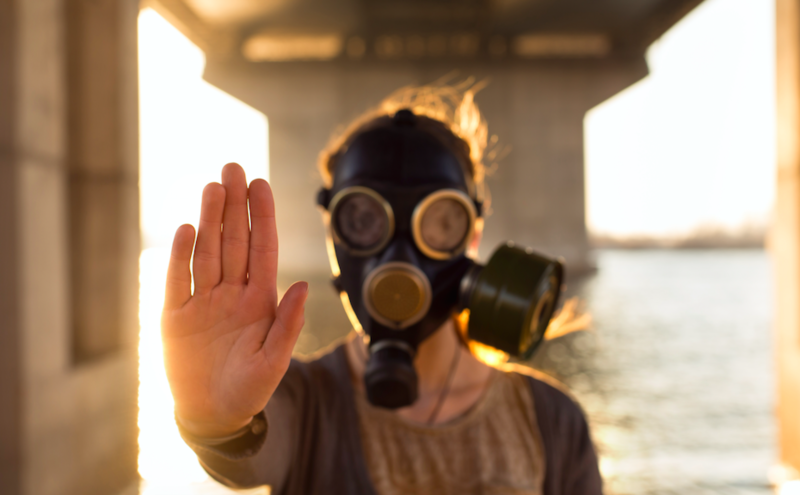 They aren’t toxic in the radioactive, life endangering sense, rather they are toxic in the career limiting sense – specifically your career. They delight in finding minor fractures in the social structure of your workplace, driving enormous wedges into them and sitting back to watch the fireworks. They enjoy bullying those they manage and emotionally tormenting those they work with. They will lie constantly but somehow no mud ever sticks to them while those all around them fall on their swords. A workplace containing a toxic person will be riddled with distrust and fear. Productivity will be at rock bottom and staff turnover will be through the roof. They care nothing for the good of the organisation or anybody in it. Their only motivation is cheap thrills and personal gain at all costs. Taking sick leave (as it provided short-term relief only). Instead, you must leave your passion for your job at home. You must become a well-mannered, honest, polite, compliant, precise employee who does whatever they are told no matter how pointless. Here are five things you should do that will make life a lot easier when you work for, or with, a toxic person. The most important rule is acceptance. You must accept that you are working with a toxic person with psychopathic tendencies. They are not wired the same as you and regard you as a tool for achieving their aims in much the same way that you might regard a photocopier. They don’t care about you at all and nothing you do or say will change that. Every time you try to interpret their behaviour using rules which would apply to you or any other normal person, you will be confused, dismayed and potentially targeted. Do not under any circumstances suffer under the misapprehension that you have changed, or can change, anything about the way they behave. Your options are survival and find somewhere else to work (or hope they do). Before you open your mouth in the presence of the toxic workmate, always ask yourself ‘Am I being polite and professional?’. Do your best to avoid unnecessary contact. This does not mean give them the cold shoulder. It just means you don’t drop by their office for a chat. Whenever you speak to them, do it within the confines of your role and for an explicit purpose. 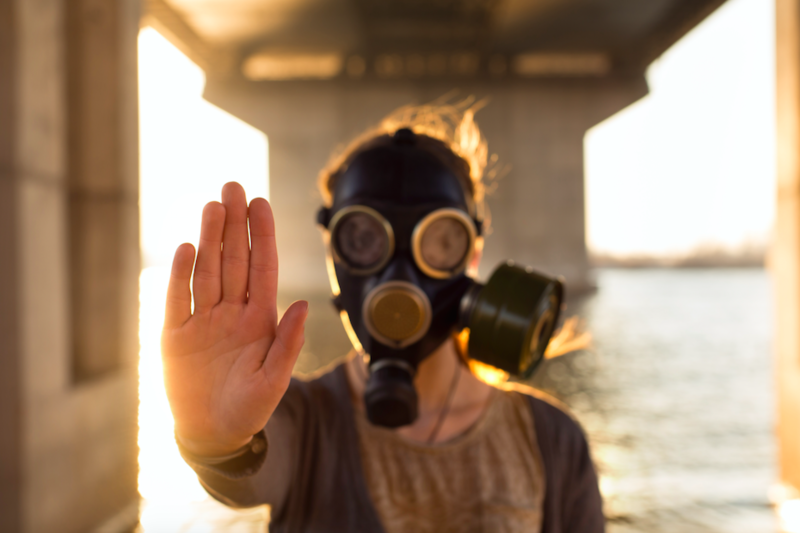 A toxic workmate will pump you for information they can use against you and others. You can defend against this by not disclosing anything to them and making sure you understand the privacy settings on your social media. Do not discuss anything that is not entirely business related. Always be honest even when it is against your interests. They will offer you an opportunity to fudge a bit. They might allow you to claim more expenses than you are otherwise entitled to. They may ignore you pilfering from the firm. They may allow you to take credit for something you did not do. No matter how much they make it seem like you’re all in this together, make no mistake, they are gathering dirt on you and they will use both that dirt and the weakness you displayed to manipulate you in the future. Learn to say no – and mean it – when anything slightly dodgy is being proposed. Otherwise they will use your weaknesses of character against you. Document every verbal request they make and seek clarity on every instruction. If you are asked verbally to do something immediately follow up the request with a confirmation by email. Retain a copy of the email in printed form. If you are not sure exactly what you are required to do, seek written clarification. If you don’t get it, send a follow-up email saying you didn’t get it, and how you interpret the task. Voluntarily provide regular written updates on your progress. In other words, behave as a competent but compliant slave that documents everything publicly. In short, you must become an emotionless machine (while at work) if you plan to stay in that workplace. Accept reality and remove all emotional responses from the way you interact with that person. Do everything they ask of you and ensure you document everything. Don’t take anything personally and make sure you have a good support network outside the workplace. Work will become a place you go to perform mindlessly (while you look for another job), but as long as you don’t become vested in that complete waste of your time and talents, it won’t kill you. (Satire alert!) Does out-of-control maverick spend in your organisation give you high blood-pressure and/or violent thoughts? Check out these suggestions for cruel and unusual ways to deal with your mavericks! 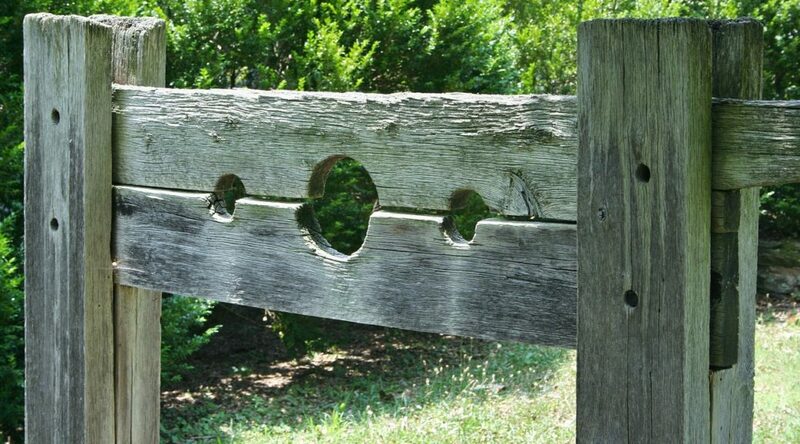 They really knew how to send a message in medieval England. After being found guilty of treason in the summer of 1305, William Wallace was dragged through London at the heels of a horse, hung, drawn (eviscerated) and quartered, with each of his four limbs sent to trouble-spots throughout the kingdom as a warning to others. One hundred and twenty years later, Pope Martin V was so infuriated by the teachings of John Wycliffe (who translated the New Testament into English) that he declared him a heretic. Wycliffe had died of natural causes 44 years earlier, but the message still had to be sent – so Wycliffe’s bones were exhumed, crushed, burned and scattered into the River Swift. Highly effective PR, right? The extreme brutality of these acts was motivated not so much by a desire to punish the offenders as horribly as possible, but as a way to discourage others from going down the same path. Infuriating. Maverick purchasing cuts profits, impacts contract fulfillment, damages supplier relationships and can mean no legal protection outside of contracts. 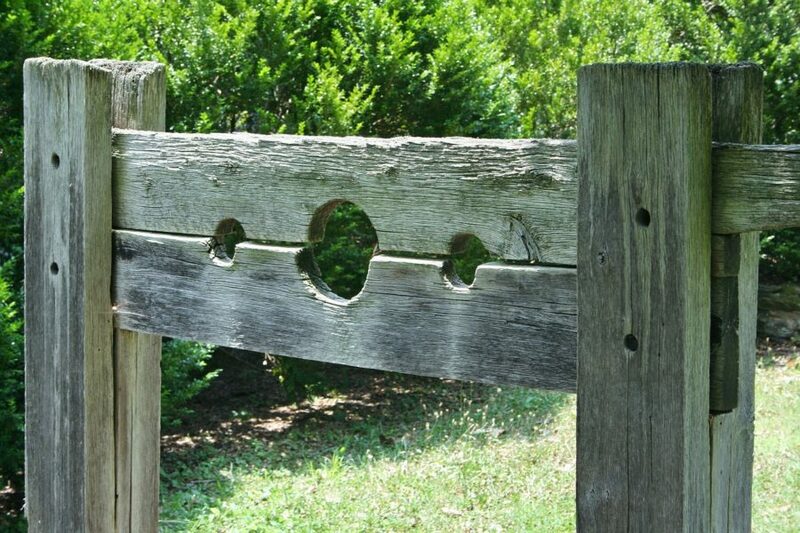 So, it being a Monday, let’s indulge in a bit of fantasy about some effective ways that procurement could deal with mavericks in their organisations. Name and shame! What if every procurement function had a Top Gear-style leader board on prominent display, listing your organisations’ worst mavericks? You could make a real spectacle out of it whenever it’s time to add a new maverick to the board (lights, music…), and even call them over to receive a prize! Pros: People will work hard to ensure they get their name off your leader board asap. Cons: With maverick spend as high as 80% in some categories, you’re gonna need a BIG board. American author Nathaniel Hawthorne’s masterpiece The Scarlet Letter tells the story of Hester Prynne, a woman accused of adultery in 17th-century Massachusetts. Hester is forced to wear a scarlet “A” (for adulteress) and has to stand on the scaffold for three hours while the Puritan townsfolk hurl insults at her. Wouldn’t it be satisfying to see your most notorious maverick skulking around the office with a giant “M” for Maverick sewn onto their lapel? Pros: Very visible, and a great way of spreading the message as your mavericks move around the office. Cons: Making people sew symbols onto their clothing is a more than a little suggestive of the Third Reich, so maybe we should give this one a miss. A “cost-conscious culture” is a workplace where employees treat every dollar of company money as if it were their own. Sounds good in theory, but even the most tight-fisted person can suddenly become extremely lavish when it comes to spending someone else’s money. The solution? What if it actually is their own money on the line? We need a piece of software that draws unauthorised purchases straight out of the offender’s personal bank accounts – and watch your maverick spend problem vanish overnight. Pros: You could spin this as procurement’s contribution to top-line growth.